To buy my book, click on the link below in the title to buy from Proverbs 31 Ministries. If you’ve given up on getting your schedule, office or home organized, Glynnis Whitwer’s newest book, I Used to Be So Organized, will help. In it, Glynnis addresses the frustrations many women feel when they can’t get a handle on their lives. The truth is, getting organized in today’s reality is like being hired for a job and given no training. Old ways of organization are ineffective given our world of information overload, increased expectations and technology advances that won’t slow down. Thankfully, we can learn new ways of managing life. Glynnis combines encouragement with lots of tips on how to bring peace and order to your life. 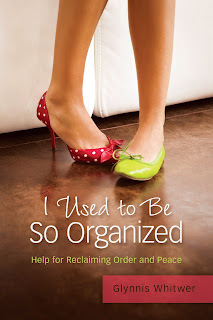 · and chapters filled with easy-to-apply organization tips for home and office.